Twitter can’t be beat when it comes to business development. Sure, it’s good for engagement, and great for sharing content. That’s what it’s really designed for, after all. But the nice thing about effective engagement and relevant content on Twitter is that you can build up a very targeted, highly segmented base of followers which essentially make them warm leads. If you want to know how to proactively source talent with Twitter’s advanced search function, Jen Picard recently published a great guide for recruiters worth reading. For just-in-time recruiting, I’d also recommend FollowerWonk, a free tool offering many of the same functions but with some nice sorting and ranking tools. Getting true value from Twitter, however, is entirely correlated (in my experience) not to who you find or engage, but who your followers are. This is my imperfect method for how I use Twitter as a biz dev tool (or “inbound marketing,” if you’d like); my target audience, obviously, is recruiting and staffing leaders and corporate talent decision makers. While I use this for marketing lead generation, obviously, lead gen is really just sourcing with a different end game. So, here’s how I use it (apologies in advance to my sample subject, but all this data is publicly available). 1. Finding Followers: Twitter’s website or native apps aren’t great for learning more about people engaging with your account, taking a couple clicks to actually access the bios of anyone interacting with your content or new followers. That’s why I recommend using a third-party app with a column view; my personal favorite is TweetDeck since it is owned by Twitter (meaning a very tight integration) and supports Boolean modifiers and top level domain tracking in its native search (which can also be turned into a column view). The column which matters most is “interactions,” and the desktop version actually uses popup notifiers so you don’t have to constantly be in a browser to monitor the most important Twitter actions, including mentions, RTs and new followers, directly in one place. This is key, because within the column view (and pop-ups), it also shows the full bios of followers in real time, on a clean display. When someone follows an account on Twitter, they are essentially opting into a database, similar to signing up for an e-mail newsletter. Which gives marketers (and recruiters) implicit permission to contact them, whether on Twitter or elsewhere. And elsewhere is what really counts. 2. Go Beyond 140 Characters: Once someone follows you (or opts in), you get the aforementioned limited bio information. In Tweetdeck, that looks something like the pic on the right. 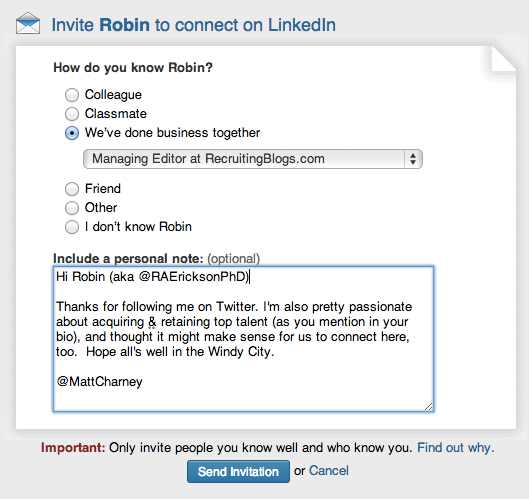 With apologies to Robin, I’m using her as an example here because she’s not only my most recent follower @MattCharney, but she’s also EXACTLY the kind of connection I want. She’s an executive at one of the most prominent and prestigious analyst firms in the human capital space, focuses explicitly on the industry that I focus my marketing efforts on and has a PhD to boot (pretty impressive in this space). I don’t know Robin, but I probably should. The nice thing about Twitter is there’s absolutely no correlation between activity on network and the value of a lead off of it; Robin, for example, has 44 followers, which is smaller than the average Twitter account (62, according to Pew). But I’ll bet she gets hammered by vendors and PR firms alike on LinkedIn – where she has 500+ followers. Had I searched for her there, like everyone of my competitors, I’d be contacting her cold and would likely get lost in the noise. In the invitation on the left, I obviously have the Twitter hook, and find using the conventions of that site off platform tend to leads to a pretty good response rate. But rather than wait around for her to accept (and hedging if she doesn’t), I then go to my next step: deep web search. 3. 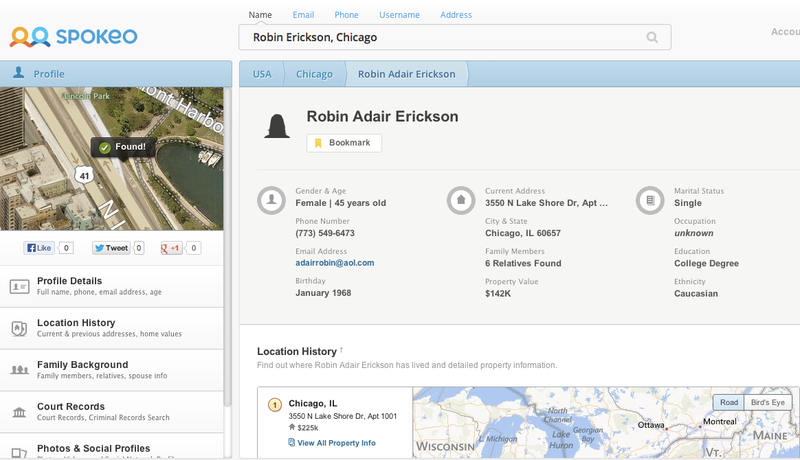 Obtaining Contact Information: Since I know Robin is a qualified lead in terms of job title and organization, and I know her location (and former employers, too), the next step for me is a deep web search. There are a lot of recruiting-focused open web search products, like Entelo, TalentBin, Dice Open Web and 3Sourcing, but most of these are geared to finding tech talent. But if you and your target market aren’t in tech, integration with StackOverflow and GitHub are irrelevant; they’re also paid tools, and if you’re like most recruiters, you probably have a limited budget. Which all went to LinkedIn Recruiter, a powerful tech with a ton of limitations. That’s where the deep web comes in. Now I not only have a personal e-mail address, but I also have a personal phone number; this information is accurate for around 9 in 10 leads. 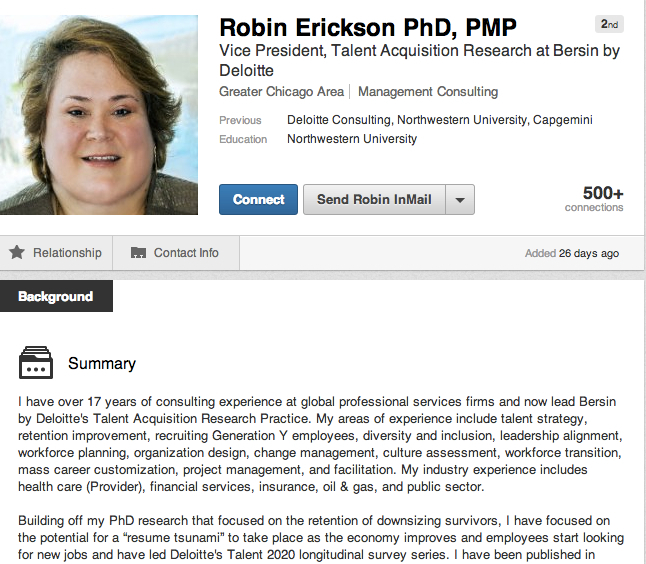 Unfortunately, in this case, Robin has a kind of generic name (there are 37 of them on LinkedIn, and she lives in a major city), so I’m not sure this is the right Robin Erickson, but at least I have a number & e-mail address where she’s likely to not get a ton of action from recruiters or marketers, unlike say, what she’s likely to have on LinkedIn or what I can find via wild card search (e.g. searching *@deloitte.com makes it appear her work e-mail matrix is first initial, last name, but I have no real way of validating whether rerickson@deloitte.com is really my target, either). I’ve now got a lead in the system – or, were this an ATS, a qualified candidate in the pipeline – and that is the first step from converting a lead into a buyer – no matter what you’re selling. Jobs included. 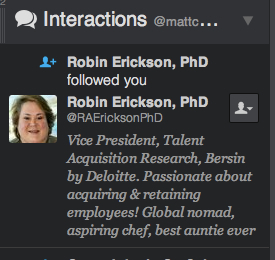 And Robin, I promise I won’t follow up with you (mainly because while I used this as an example, I also know that this is another Robin Erickson – if I wanted yours, I’d just check out the Northwestern alumni database. Go Cats!). That’s what I use Twitter for, anyway. It’s where it’s @.